Unlawful Use of Weapons | Polinske & Associates, P.C. and for repeat offenders carry the very real possibility of prison time. The first concern is bonding out of jail. The bond for these charges is relatively higher than for other offenses. A bond reduction motion may be your very first legal step. Even for bonds that are very high initially, there is a very good chance the bond amount can be lowered. After posting bond and getting released your attorney will begin to gather discovery after the preliminary hearing. In these types of cases there may be dashcam and statement evidence, as well as forensic weapon testing. Sometimes a Gunshot Residue test is employed. Your attorney must be knowledgeable in all facets of these charges. Legally, this field has had some major changes in it over the last few years. 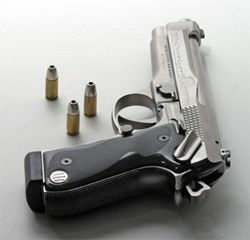 The federal circuit judges have ruled that a person is constitutionally able to carry a concealed weapon. There are pending cases before Illinois appellate and the Supreme Court concerned with what versions of UUW a person may be convicted of when the State can proceed against a person with both a felony and misdemeanor version of the UUW statutes. This is a major issue that your attorney must have a precise grasp of to effectively represent their clients. Because of this legal flux various counties have taken different approaches towards resolving both felony and misdemeanor versions of UUW. Recently, I represented a man who was charged with felony UUW after his car was searched and a loaded firearm was discovered in the glove box. The State refused to offer him a reduction to a misdemeanor. We filed a motion to suppress the evidence. This occurred during the time when the 7th Circuit Court of Appeals overturned the UUW statute. We were able to secure a dismissal of the charge against him. I had another gentleman who was charged in Fayette County with Agg. Discharge of a Firearm and Felon in Possession of a Weapon. We are in the middle of the case but I filed a motion to suppress evidence. I am confident we will win the motion (it is under advisement) as the officer did not have a legal basis to search my client's residence. I have represented many people in St. Clair County on these charges. To date I have not had a client that has had to plead guilty with a permanent felony conviction on their records. That is my goal in each of these cases. I understand the repercussions a conviction for these offenses has upon my client. Choose your attorney wisely. He/she must have a very good grasp of the law surrounding these charges. Not just the elements of the charge but also the body of law developing in both federal and state courts which are intepreting the 2nd amendment and Illinois' UUW statutes. If you would like us to reveiw your case call me today for a free consultation.